To children (especially younger ones) money is a very difficult concept to understand. It is very hard for someone with no income and who does not understand how many things work in society to grasp the concept of money. 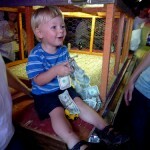 It is important to teach children about money at a young age. As soon as they start to ask how much things cost and why is the perfect time to ease money management lessons into their lives. When these lessons begin, use only cash to illustrate concepts to kids. It will be much easier to them to learn with cold hard cash than gift cards, prepaid cards or checks. I am a huge proponent of allowing your children a small allowance in exchange for completing household tasks and achieving good grades. It encourages hard work and can teach volumes about managing money. It shows children (on a smaller scale) how people earn money, and if you are lucky, you will end up having the kind of kid who is willing to do even more in exchange for a “raise”. If this situation does arise, engage the child in a negotiation and teach them some valuable lessons in haggling. They will have to learn these skills somewhere. If your kid(s) are with you in the store, let them see you using cash. Especially if they already receive an allowance. Let them realize how much items cost and do not hesitate to let them choose to spend their own allowance money. After a few foolish purchases, youngsters soon realize the value of money and that spending on needless items prevents them from collecting enough for items they really want or need. If you are constantly using credit or even debit cards, you may be giving your child the wrong idea about money, even if you are doing it right yourself. Unless you divulge every aspect of your financial life to your child (which I advise against), they have no idea how money relates to the card. For all they know, that piece of plastic is magic and gives you everything you could possibly need. Recommend that your child put half of his/her allowance in the savings account you have (hopefully) set up for them. If they choose to NOT save any of their allowance, give it a few months and show them how much they would have saved if they were putting half of their allowance away. They may likely change their mind. Another benefit to teaching saving is the profound effect it will have over time. If saving is taught early, kids often have good money habits for life. Not to mention that a savings account will teach them how to manage a bank account, read statements and keep track of debits and credits. Kids have no idea how a roof is put over their head, how clothes get purchased, or how that electricity they take for granted is paid for. They probably do not even realize that mom and dad have to pay for these things. If you want to really open the kids’ eyes, get out your mortgage statement or your utility bill and how them how much it really costs to live comfortably. It may just give them a new appreciation for the things you do…or it may just fly over their heads and they will jovially continue to leave all the lights on and ruin their clothing in the yard. Regardless of how you handle your children and teach them about managing money, it will have to happen eventually. You can take the proactive role by teaching small lessons over a number of years, you can have school do their (normally) poor job at teaching personal finance, or you can do neither and hope that learning the hard way will teach them quickly. Children thirst for knowledge, so the more you teach about finance at a young age, the more they will benefit as they grow into young adults.